ABOUT 60% OF ALL BABIES HAVE JAUNDICE. JAUNDICE USUALLY OCCURS IN NEWBORNS BECAUSE THEIR LIVER IS NOT FULLY DEVELOPED. THERE ARE SEVERAL RISK FACTORS THAT NEED CLOSE MONITORING AND EARLY JAUNDICE MANAGEMENT. Physiological (normal) jaundice: occurring in most newborns, this mild jaundice is due to the immaturity of the baby’s liver, which leads to a slow processing of bilirubin. It generally appears at 2 to 4 days of age and disappears by 1 to 2 weeks of age. Breastfeeding jaundice: jaundice can occur when a breastfeeding baby is not getting enough breast milk because of difficulty with breastfeeding or because the mother’s milk isn’t in yet. This is not caused by a problem with the breast milk itself, but by the baby not getting enough to drink. Pre-term Babies: Babies born before 37 weeks, or 8 ½ months, of pregnancy might have jaundice because their liver is not fully developed. The young liver might not be able to get rid of so much bilirubin. Babies with Darker Skin Color: Jaundice may be missed or not recognized in a baby with darker skin color. Checking the gums and inner lips may detect jaundice. If there is any doubt, a bilirubin test should be done. East Asian or Mediterranean Descent: A baby born to an East Asian or Mediterranean family is at a higher risk of becoming jaundiced. Also, some families inherit conditions (such as G6PDdeficiency), and their babies are more likely to get jaundice. Feeding Difficulties: A baby who is not eating, wetting, or stooling well in the first few days of life is more likely to get jaundice. Sibling with Jaundice: A baby with a sister or brother that had jaundice is more likely to develop jaundice. Bruising: A baby with bruises at birth is more likely to get jaundice. A bruise forms when blood leaks out of a blood vessel and causes the skin to look black and blue. The healing of large bruises can cause high levels of bilirubin and your baby might get jaundice. Blood group incompatibility (Rh or ABO problems): If a baby has a different blood type than the mother, the mother might produce antibodies that destroy the infant’s red blood cells. This creates a sudden buildup of bilirubin in the baby’s blood. 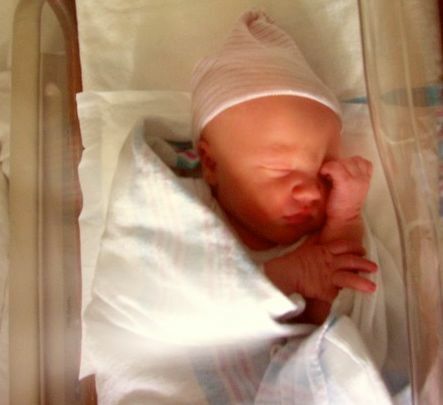 Incompatibility jaundice can begin as early as the first day of life. Rh problems once caused the most severe form of jaundice, but now can be prevented with an injection of Rh immune globulin to the mother within 72 hours after delivery, which prevents her from forming antibodies that might endanger any subsequent babies.